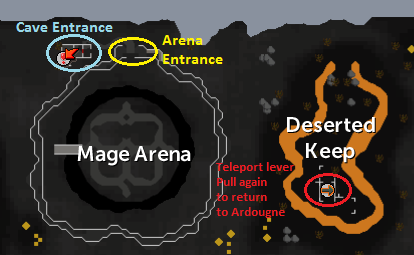 The Mage Arena is located deep in the Wilderness. Inside the arena you will find a deadly Wizard known as Kolodion, and after defeating him you'll have the ability to obtain God Capes and God Staves, used to cast more powerful spells! 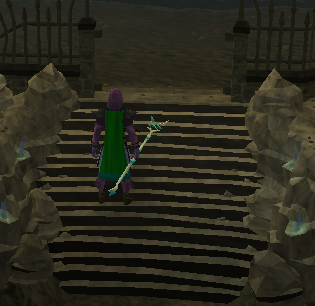 You'll find the Mage Arena in the deep level 73 Wilderness, just beyond the gate separating Freeplay and Members' Wilderness. I'd suggest against walking all the way there, as the Wilderness is a dangerous place and there's no telling if there's a PKer out there waiting to attack you. Instead of walking, head to East Ardougne. 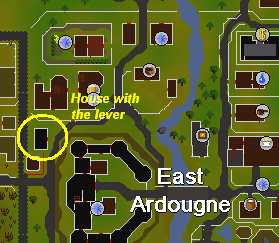 There's a house just northwest of the Ardougne Castle with a lever inside that will teleport you to the Wilderness when pulled. Beware, if the door is already open, it's likely that someone has already been there and is waiting for a kill in the Wilderness. 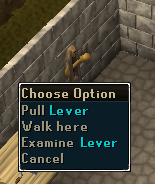 There is also a lever in Edgeville near the Yew Trees that will teleport you to the same place. Before pulling the lever, be sure to bring a sharp weapon such as a Sword or Axe! Pull the lever and you'll find yourself in level 69 Wilderness. Head north for a bit and you should find a Web blocking the way. You'll need a Machete, Hatchet or any other sharp weapon to slash through, and once it's been cut just go through. Walk west until you find the large arena, and if you see any PKers quickly switch to another world. A good place to switch is just south of the arena, as no one goes there. At the northern end of the arena is a destroyed house with 2 webs inside. Cut them and pull the lever to find yourself in a cave that is safe from attacks. Gundai - He is a banker and will allow you to access your bank. Lundail - He sells all Runes, except for Blood and Soul. Kolodion - He will be your opponent in the Mage Arena once you are ready. Of course, there are certain rules to be followed in the Mage Arena. First, you need at least level 60 Magic to enter. You can bring any type of armor or weapon into the arena, but you can only use magical attacks; not ranged or melee. Monk Robes or Zamorak Robes - for Magic and Prayer. An Elemental or Mystic Staff (Air, Water, Earth or Fire), depending on what spell you'll be using. Runes - Chaos or Death are your best options. If you have enough Deaths, use Fire Blast and you should be OK. You'll also need the other Runes (Air, Water, Earth, Fire, etc.) depending on which spell you wish to use. Prayer Potions - several 4-dose potions should be fine. Food - if you bring enough Prayer Potions, you really don't need much, if any at all. But bring some just in case something goes wrong! Holy Symbol or Magic Amulet. God Book - gives +5 to Prayer. If you happen to die, you can get it back with any pages that you had by speaking to Jossik at the Lighthouse. Gnome Hat - for a Magic bonus. 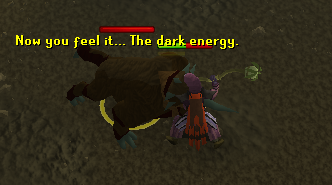 Speak to Kolodion when you're ready and you'll be teleported to the Mage Arena. You must fight 5 different monsters in a row. Just put Protect From Magic on and fight him! Tip: You can leave the fight at any time and have your progress saved by pulling a lever located at the outer ring. When you return, Kolodion will be in the form you left him in, although his health will be at 100%. The first form is easy to defeat, and if you're strong enough you may not even need Protect From Magic. More difficult than the first form, and you'll probably want to use your Protect From Magic Prayer from this battle until the end. This form will use even more powerful Magic. Much like the third form, the Ghost form will hit hard without your Protect From Magic Prayer. You're almost there, keep going! Be prepared for a fight, as this form has lots of hits and will cast strong spells. Once you've defeated all 5 forms of Kolodion, you will be teleported back to the cave. Step into the Sparkling Pool and you'll be teleported again. There you'll find the Chamber Guardian. 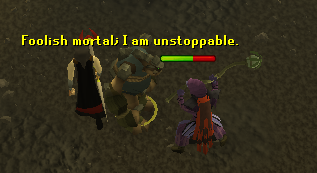 Talk to him and he will tell you that you must now choose a God of RuneScape, who you will fight for. 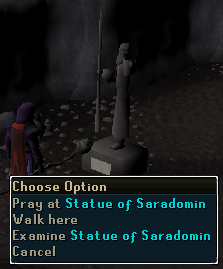 Go a bit further north and you'll see statues of the 3 main RuneScape Gods. Pray at your favorite God to receive a God Cape which gives +10 to your Magic Attack and Defence Bonus. Go back to the Chamber Guardian and he will give you a staff of your chosen God for free. You can buy the other staffs from him for 80,000gp each. 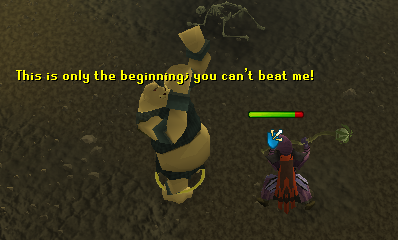 If you ever decide on training a new spell, you'll need the cape of the same God. 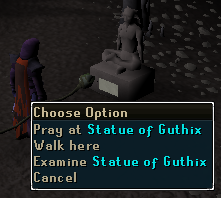 Simply drop your current cape and pray at another God's statue to receive a new cape. If you wish to use your new Magic spell outside of the arena, you'll need to train. To get back to the Mage Arena, run up the below stairs After casting the spell 100 times, Kolodion will tell you that you are experienced enough with that spell and you'll be able to use it outside of the Mage Arena. Inside the arena are Mages that fight for their god. If you wield a God's staff, the Mages that don't follow that god will attack you. 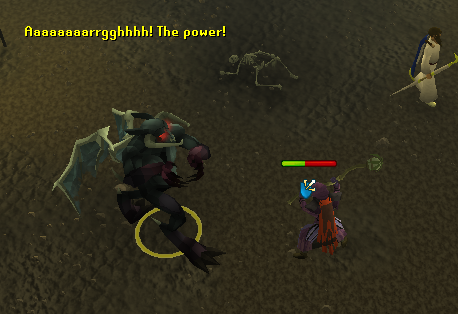 Note that you can also be PKed while training. Since you must cast divine storm one hundred times before obtaining the ability to use it anywhere, you'll need 500 air runes. Abilities do not count towards the one hundred casts. However, you can still wield your staff outside of the arena. 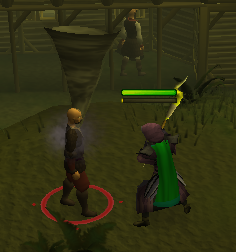 After the Evolution of Combat update, all God spells were replaced with Divine Storm, a level 60 magic spell.